Malignant mesothelioma clinical trials are an option if you or a loved one has been diagnosed with this serious disease. A common misconception says only those people with no other options remaining can participate in a trial. On the contrary, there are trials for people in all stages of the disease. Before any humans are used in a trial, many years of research have gone into the effects of the treatment – in the lab and on animals. Researchers want to know the effect on the cancer cells and if there may be side effects. Once they think they have a possible treatment, it’s time to involve people in the trial to truly know if this is a treatment worthy of further development. Each trial is planned in detail by a highly trained expert before anything happens. Why conduct this trial? Who can participate in the trial? How many people? Explicit directions on the drug used, the dose, the timing, and other treatments that may be involved are created. There will also be a plan for all tests that will be performed and the interval between tests. Another important component is to know details about the people taking part and what information will be gathered from them. It is a fact that many lives have been saved, or lifespans increased, due to the knowledge gained in clinical trials. Not only do trials test the effectiveness of the new drug or treatment, but also the safety. Past trials have found new ways to detect and prevent cancer. When you, or a loved one, participate in a clinical trial, you are adding to the knowledge that may help you, but may also add to the arsenal of weapons to fight cancer for other patients. Clinical trials are vital for the advancement and future elimination of cancer. Where are current malignant mesothelioma trials? There are currently 38 trials specifically geared toward treatment of malignant mesothelioma supported by the National Cancer Institute (NCI.) Click here for the list. Talk to your doctor to determine if any are right for you. The sixties-styled building along Stemmons Freeway has a long and varied history, but the first step to revive the Cabana Motor Hotel was demolition and that meant asbestos abatement for this 1960s structure. Designed by Melvin Grossman, construction began in 1961 and opened in 1963. The hotel had a modern design new to Dallas and the interior projected an ancient Roman theme throughout. A replica of Michelangel’s David as well as Venus de Milo and Winged Victory adorned the lobby. Intricate tiles and marble added to the luxurious furnishings for the time period. The hotel was 10 stories tall with a grand staircase and a wide array of amenities. The developer was Jay Samo who had previously build two other Cabana Hotels, but the Dallas one was his most opulent. He went on to develop Caesar’s Palace and Circus Circus in Las Vegas. Marty Melcher, Doris Day’s husband at the time, invested her money in the project. The Teamsters were also investors under the direction of Jimmy Hoffa. 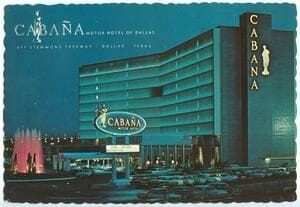 For long-time Dallasites, the Cabana Hotel was known as the “hotel where the Beatle stayed” in September of 1964. It was a place for celebrities in its early years including, Jimi Hendrix, Led Zeppelin, and Jimmy Hoffa. Raquel Welch was employed there as a waitress in the lounge. As a waitress, she would have been called a “goddess” and worn a short toga. Many top names in show business performed at the hotel in rooms such as the Bon Vivant Club and Nero’s Nook cocktail lounge. Just six years after opening, the hotel was sold to the Hyatt House and renamed the Hyatt House Hotel. Then seven years later, Hyatt sold it to Holders Capital Corporation and it was renamed DuPont Plaza. The most shocking development came in 1984 – just over 20 years from its opening as a grand hotel –when it was purchased by Dallas County and turned into a minimum security jail. Almost thirty years later it was sold again; this time to Lincoln Properties with plans to demolish the building and replace it with a data center. That never happened and it was on the market again in 2016 and purchased by Circa Capital Corporation. Finally, the hotel was once again valued for its unique design and history, but was passed again to Centurion American Development Group – a firm that recently completed restoration of the Dallas downtown Statler Hilton. Demolition began with removal of asbestos throughout the building. Asbestos was used extensively for construction in the 1960s, but is a dangerous, and sometimes fatal, health problem when disturbed. When fibers are released into the air, they are easily inhaled and can cause lung cancer, asbestosis, and mesothelioma – a fatal disease. The company is retaining historic elements that remain, but as the CEO of Centurion American, Mehrdad Moayedi said, “We are demoing stuff that is not historic. There were holding tanks and bars between the balconies and rooms.” The lobby and ballroom were converted from the original two-story design to separate floors during the prison phase. The pool was filled in and interior finishes were removed. The final plan calls for converting the hotel to 262 new rooms plus restaurants. In addition, the plan includes a 140,000 square foot apartment tower on top of the hotel’s garage. At present, a historic plan from the developer is in Austin to be approved. In 2015, Preservation Dallas named the building as endangered to assist in saving the old hotel with its mid-century architecture. These historic designations are important for acquiring special financing for historic structures. If all plans proceed as expected, construction will begin in 2019. As of 2018, the failure to ban asbestos remains a global problem that will plague the world for many decades to come. Though 66 countries have banned asbestos because of its proven health risk, there are still many that have not. In fact, half of the G20 countries still mine or use asbestos. The G20 countries comprise the 20 top countries contributing to the global economy. Almost two-thirds of the world population lives in these countries, producing four-fifths of the gross world products and three-quarters of global trade. G20 countries that have not banned asbestos include the United States and our North American neighbors, Canada and Mexico. Though there are some limitations, the United States has not banned the use of asbestos. In 1918 a report on diseases from asbestos exposure was published. Through the following decades additional research documented the impact on health. Yet, the 1960s through the 1970s saw widespread use of asbestos in everything from ships, to multiple construction applications, to brake linings, to any industry using high heat processes – even in baby powder. Efforts to ban the mineral have been ongoing for many years. In 1970 the Occupational Safety and Health Act was passed outlining guidelines for use. In 1971, OSHA issued the first regulation for general industry. The National Institute for Occupational Safety and Health (NIOSH) first recommended a ban on asbestos in the workplace in 1976. Other partial bans were put in place in the decades since, but many asbestos-containing products are still allowed in US markets. The 2016 revised Toxic Substance Control Act (TSCA) provided some hope that a ban could come, but only time will tell. As a consequence of these prior – and current – exposures, 12,000-15,000 Americans continue to die each year due to mesothelioma, lung cancer, and asbestosis. Other deaths occur due to various cancers of the larynx, ovary, and complications from non-malignant asbestos-related diseases. Asbestos-caused diseases are preventable. Science has proven that all levels of any type of asbestos can be deadly. A strategy to prevent further exposures through a complete ban on all manufacture, import, and use of asbestos has been proven effective. There is no logical reason to delay a ban. The Canadian government has promised a comprehensive ban on the mineral this year. Two health agencies, Health Canada and Environment and Climate Change Canada, sponsored the Prohibition of Asbestos and Asbestos Products Regulations that would prohibit the import, use, and sale of asbestos and products containing it. However, there are anti-asbestos champions that say these regulations would have too many exemptions and would not cover asbestos-containing products produced and installed before the regulations take effect. Mexican companies use asbestos in many products – roofing, boilers, pipes, brakes, and wires are a few of the products produced by over 2,000 Mexican companies. Mexico, along with China and India, leads the asbestos market for developing countries. The material is cheap and versatile, and therefore appealing to these countries in spite of the proven health hazards. Because of this growing market, experts predict deaths from asbestos may reach ten million worldwide by 2030 and thousands of those will come from Mexico. The Mexican Social Security Institute oversees public health under the federal Secretariat of Health. A physician and researcher with the institute, Dr. Guadalupe Aguilar Madrid, asserts the weak worker protection laws permitted these dangerous conditions to continue. “The epidemic can grow like it grew in the countries that started to work with asbestos after the Second World War.” She predicts the death toll from asbestos-related diseases will rise from 1,500 currently to approximately 5,000 annually and will continue to rise without a total ban of asbestos. While any asbestos-caused cancer can be deadly, that is especially so with mesothelioma. Yet, health experts estimate only 29% of mesothelioma deaths are reported. Aguilar points to an asbestos trade association, the Instituto Mexicano de Fibro Industrias (IMFI) as the lead in opposing restrictions or a ban on asbestos. The founder and president of this group, Luis Cejudo Alva, proclaimed, “Why does this lady [Aguilar] say that the dust that comes from the asbestos sheets kills people? It is only dust . . . These sheets are an answer for people’s needs.” The IMFI and the Mexican government are in close agreement, meaning an asbestos ban in Mexico is not seen for the foreseeable future. Despite all the scientific proof of the deadly consequences of asbestos exposure, Mexico works hand-in-hand with Russia to not only keep asbestos in their respective countries, but to encourage other countries to continue its use as well. To disguise the continued use of asbestos, the word “asbestos” is no longer used. It is now the “fibre industry” making “fibre-cement” products, but this fibre industry will kill Mexican citizens for many decades to come. While the three North American countries could have been world leaders in the abolishment of asbestos, they are instead responsible for the painful deaths of thousands of their citizens and citizens throughout the world who received imported asbestos products or exported them to North America. Asbestos-related diseases are totally preventable, but with the long delay between exposure and diagnosis, it is imperative to ban these products immediately. They are embedded in the fabric of our lives and it will take a concentrated effort to remove those already installed and stop – completely – any further mining or use. That day seems very distant, but it is important that we citizens speak up to our governments and let them know we understand the dangers from their failure to ban asbestos. In the US, contact your congressional representatives and the Environmental Protection Agency (EPA) and let responsible parties know a ban is necessary. Clean up, North America.